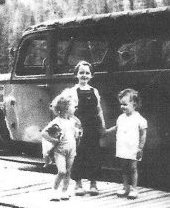 Janet is at right, her sister Joan in the middle, and cousin Judy at left. Gallatin Camp, 1937. The summer of 2014 marked 75 years since author Janet Chapple first spent a summer season in Yellowstone. To celebrate, YellowstoneTreasures.com serialized excerpts from her memoirs of her experiences from 1939 to 1942 on her blog. Here we collect them all for your convenience.